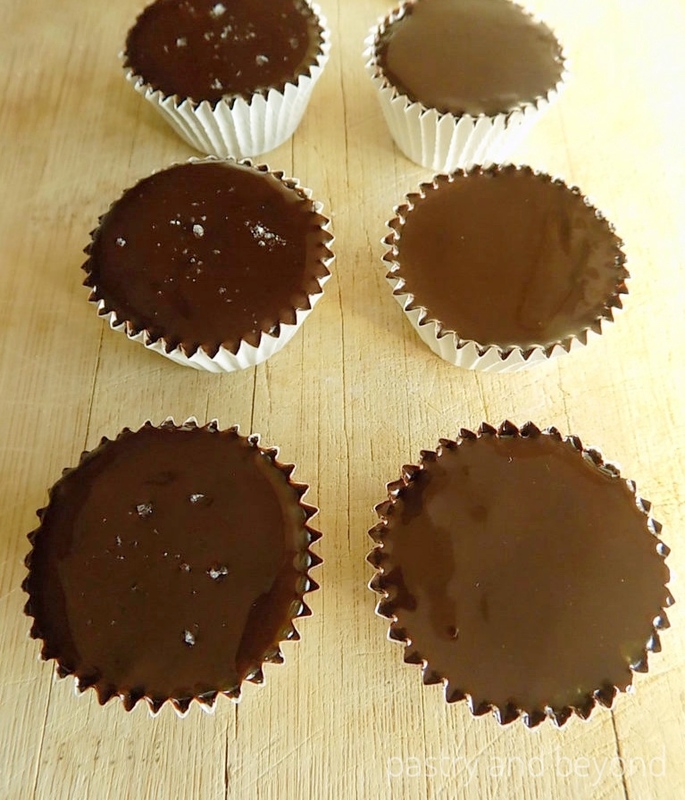 These mini chocolate caramel cups are perfect with my homemade caramel sauce. 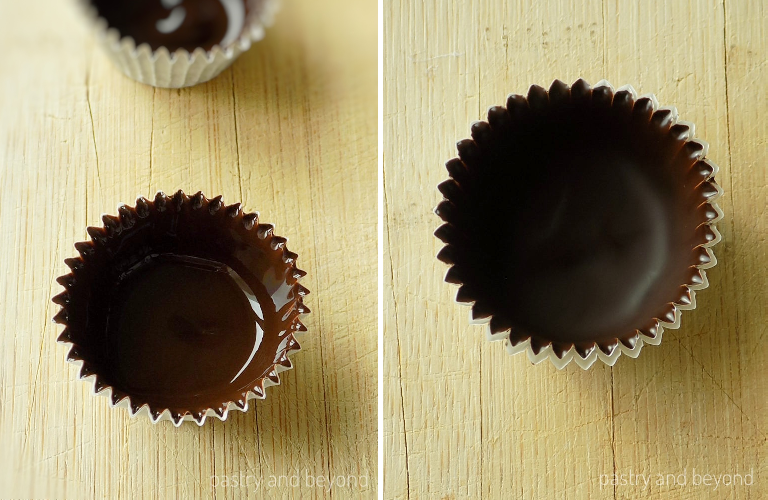 You’ll be surprised how easy it is to make chocolate cups. I love caramel a lot. 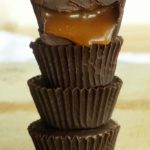 I’ve recently made my homemade caramel sauce and decide to share my mini caramel chocolate cups recipe. These cups look so good besides their taste. I love the color combination. 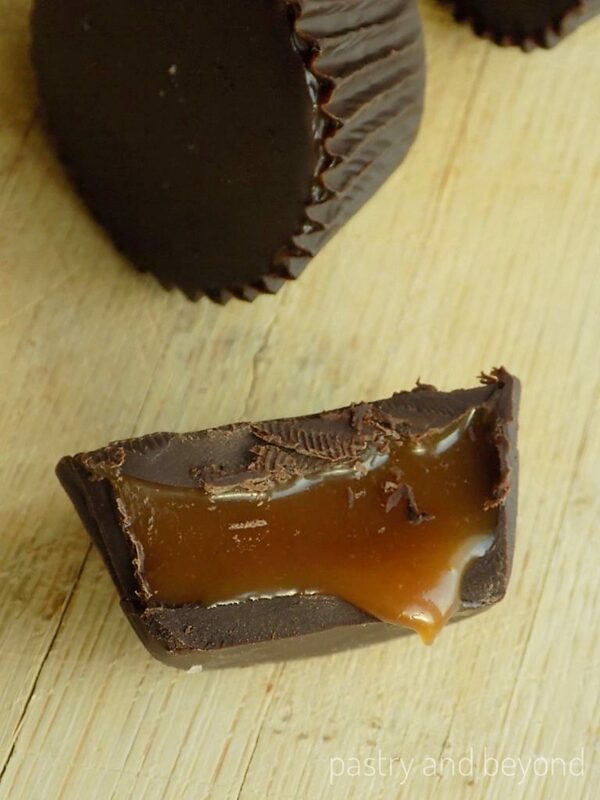 You eat my silky, smooth homemade caramel sauce-which I make with only 2 ingredients-in a chocolate cup. In today’s post, I use only 3 ingredients: sugar and heavy cream for my homemade caramel sauce and semi-sweet chocolate for making the cups. They look scrumptious but very easy to make. 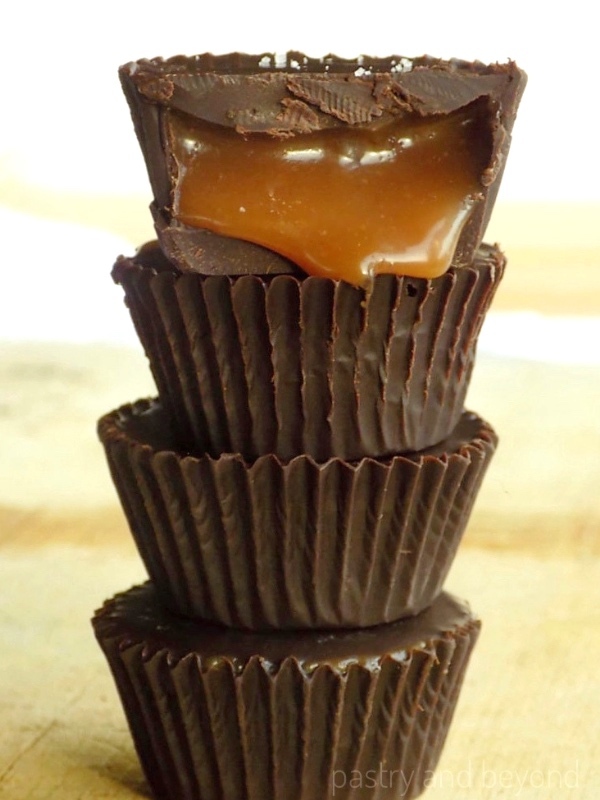 I like using my brown cupcake liners when making these caramel cups as they look nice when serving. But I use white cupcake liners for this post to make the steps clear for you. I use semi-sweet chocolate which balances the sweetness of the caramel. You can sprinkle sea salt if you like, or serve it plain. First I make my homemade caramel sauce and set aside to cool. If you like you can use the wet method. 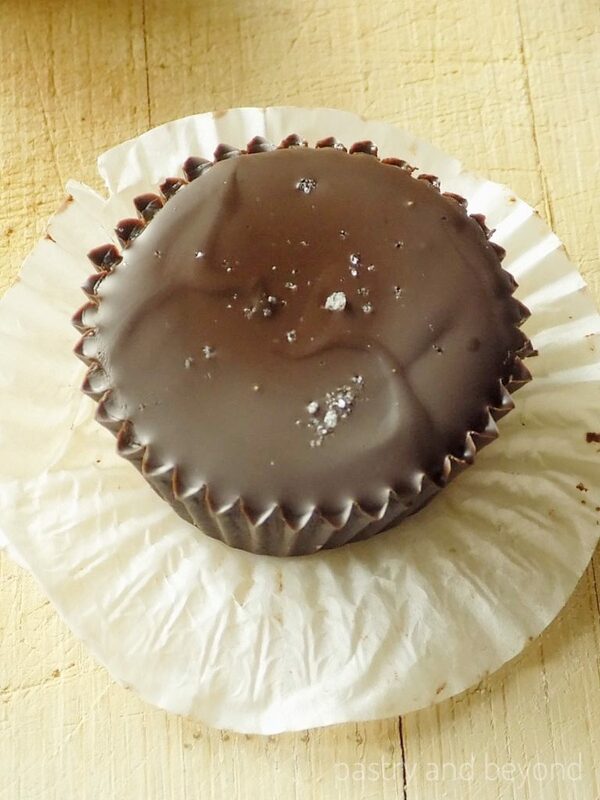 Then I start to make my chocolate cups. I melt chocolate over bain-marie. First I place the chopped chocolate into a heat proof bowl that sits over a pan of simmering water. Then I stir often. After the chocolate melts, I set aside for 5 minutes. Then I put 2 teaspoons of melted chocolate into the cupcake papers. I use back of my spoon and take some of the melted chocolate from the bottom to cover the sides of the paper and I also swirl the cups. Then I put them in the refrigerator for 15 minutes or until the chocolate sets. 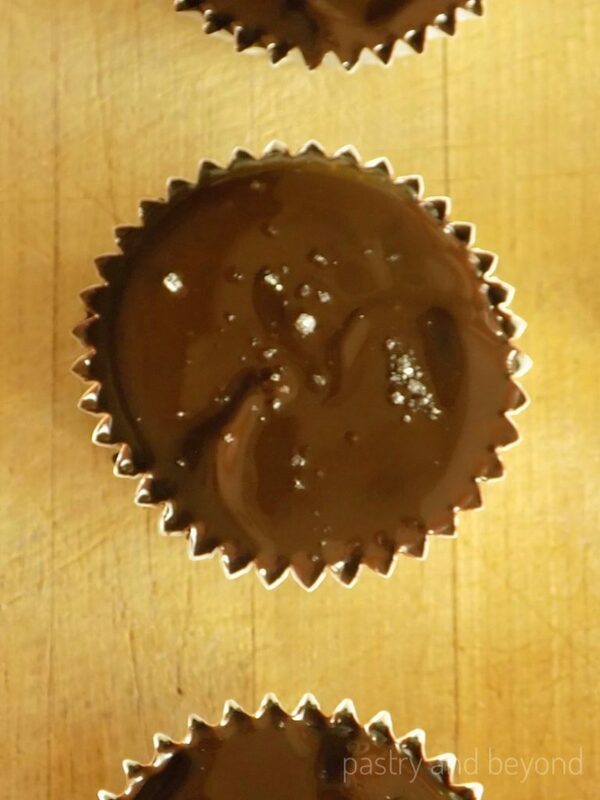 When the chocolate sets, I add 1 and 1/2 teaspoons of homemade caramel sauce. The caramel sauce shouldn’t be liquid, should be slightly thickened. After adding the caramel sauce, I cover the top with melted chocolate. I sprinkle sea salt on some of the cups and I leave some plain for those who may not prefer salt. I let them set for 20-25 minutes. Finally, I gently remove the papers before eating. 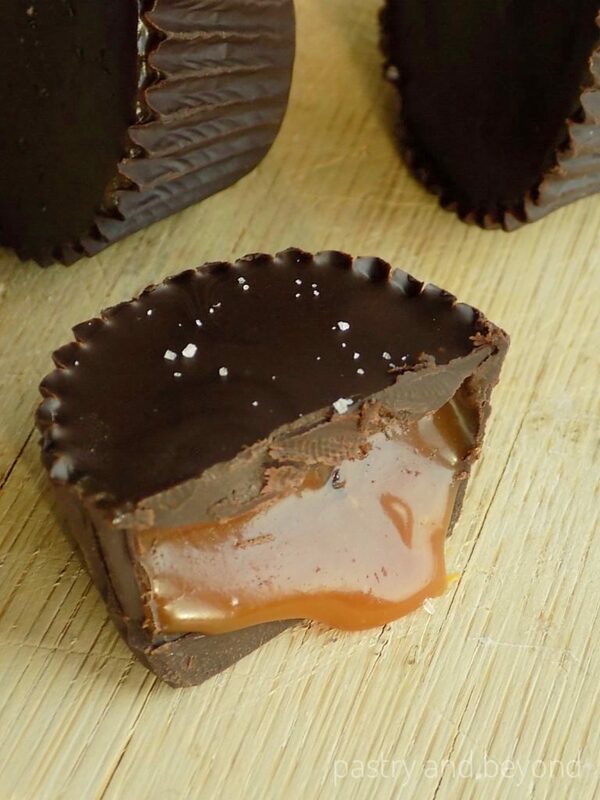 You'll love these delicious and easy to make chocolate caramel cups with 3 ingredients. Melt the chocolate over bain-marie: Place the chopped chocolate into a heat proof bowl that sits over a pan of simmering water. Stir often. Set aside for 5 minutes. 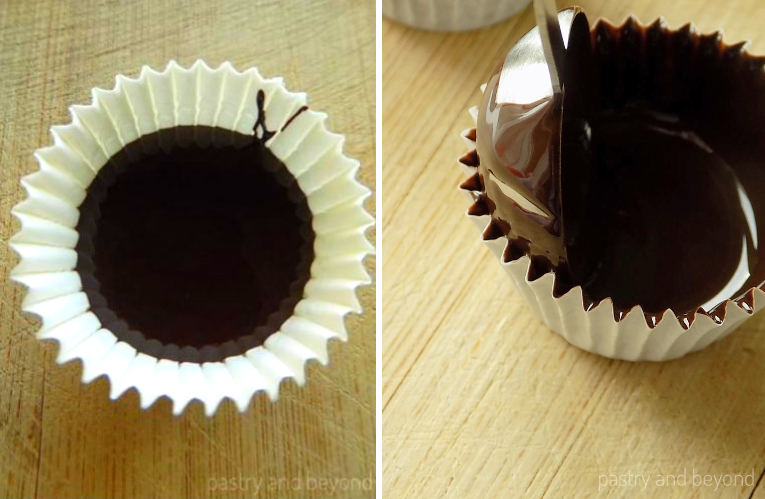 Take out 16 small cupcake liners and fill each of them with two teaspoons of melted chocolate. 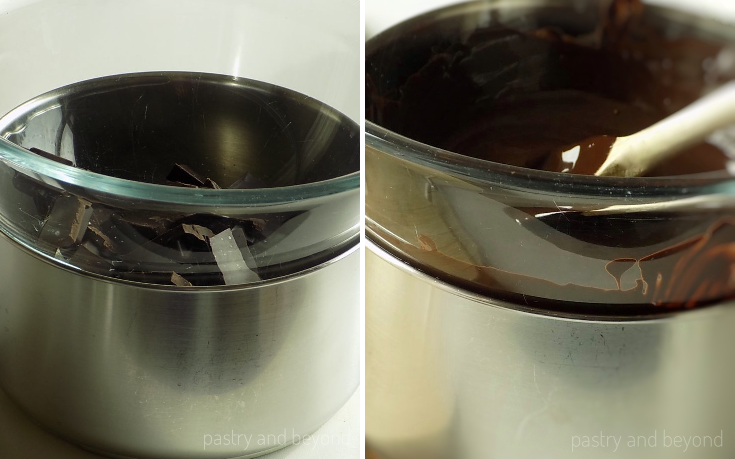 Use back of your spoon and take some of the melted chocolate from the bottom to cover the sides of the paper. Also you can swirl the cups to cover the sides. 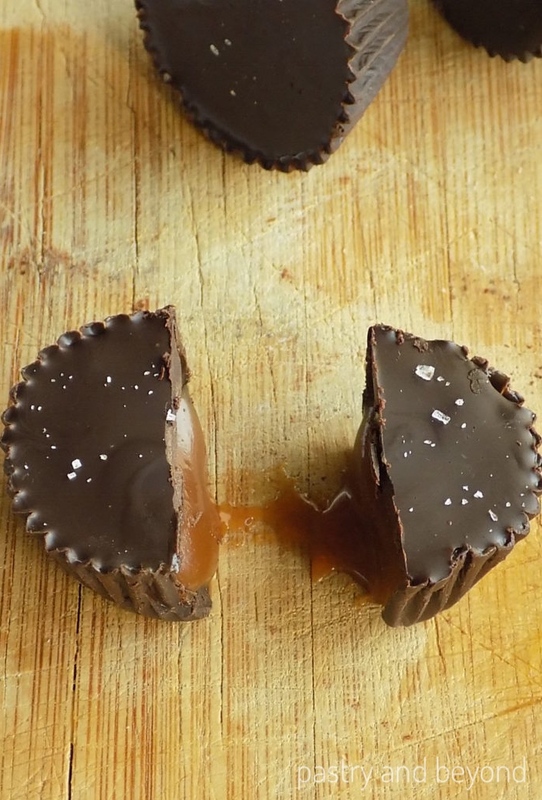 Be sure you cover them well so the caramel stays inside the cup. Keep in the fridge for 15 minutes or until the chocolate sets. Remove the cups from the fridge. 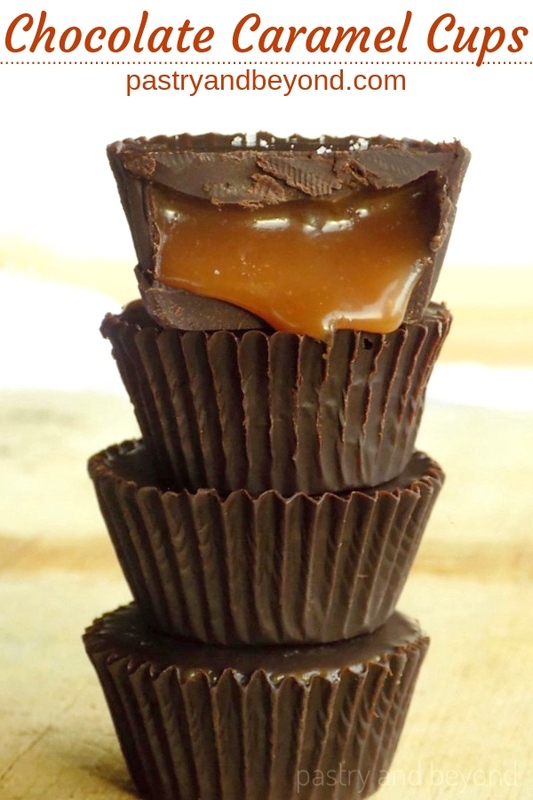 Fill each cup with 1,5 teaspoons of caramel sauce. Cover the top of the caramel sauce with 1 teaspoon of melted chocolate and use the back of a spoon to spread the chocolate easily. Keep in the fridge for almost 25 minutes or until set. If you prefer, you can sprinkle sea salt on top. Gently remove the cupcake papers before eating. *You can click here to make the dry caramel sauce recipe with step by step pictures or here for the wet method. You'll need less than 1 recipe, 200g caramel sauce. Update Notes: I originally shared this recipe on January 6, 2017. Today I republish with new photos.